With the goal of helping local media better understand and cover this complex issue, our missions in the Democratic Republic of Congo (MONUSCO) and the Central African Republic (MINUSCA) recently brought together some 100 journalists during three workshops held in Kinshasa, Goma and Bangui. “This activity is part of our transparency efforts, but it is also a way to help media professionals in the Central African Republic get a better understanding of what sexual exploitation and abuse is”, said MINUSCA Spokesperson Vladimir Monteiro at the end of the session which he co-chaired with a Conduct and Discipline representative on 5th October 2017. 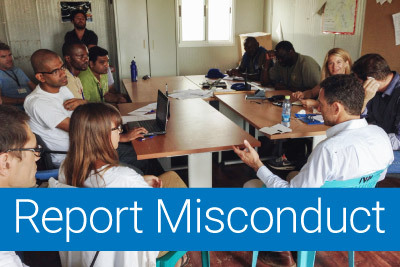 During these workshops, local media are briefed by the Mission Spokesperson and Conduct and Discipline representatives on the definitions of sexual exploitation and abuse, the United Nations’ zero-tolerance policy, as well as global UN and mission- specific efforts to prevent and respond to allegations including victim assistance protocols and sanctions applied by UN and Member States. Participants in both countries were also reminded of ways to report an allegation through the Missions’ hotlines or through community-based complaint networks in areas where the UN operates. In Kinshasa, the United Nations Population Fund (UNFPA) outlined what kind of psychological and medical support is given to victims as part of the UN Comprehensive Strategy on Assistance and Support to Victims of Sexual Exploitation and Abuse. According to Cudgenslhey Alexandre, Conduct and Discipline Officer at MINUSCA, reaching out to the media is important to leverage its reach. “Media has the power to communicate with and reach the most remote communities, by targeting the most vulnerable who may not have access to internet or other means of communications, other than a simple radio set,” he said. “In turn, those who receive these important messages can disseminate them locally”. Participating journalists also received ethics guidance on how to prepare for and conduct interviews with victims, who are particularly vulnerable. USB keys branded with the respective reporting hotlines were distributed to the journalists, including key documents, videos and fact sheets on the UN’s efforts to prevent and respond to this scourge. “It is a very sensitive issue and, as per the Secretary-General's main focus, victims must be protected. So we want to give local media the tools to report on this topic and we will continue this partnership because media are key in leading this fight”, concluded M. Monteiro. These workshops are part of a pilot project on outreach to affected communities implemented by the UN Department for Peacekeeping Operations (DPKO) in partnership with the Department of Field Support (DFS), MONUSCO and MINUSCA.